Preschoolers–and their parents–will be excited about the brand-new, never-before-seen episode, “La Maestra de Musica,” in which Dora’s music teacher has to get to school on time but has a broken bicycle. 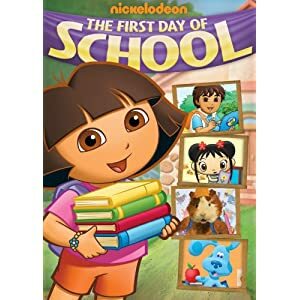 As always, viewer participation is strongly encouraged as children get to learn and practice Spanish vocabulary words and practical skills along with Dora and Boots. They’ll also gain a real appreciation for music and realize that even the most difficult obstacles can be overcome with a positive attitude and a song in your heart. Would you like to win a copy of each? Fill out the form below to enter! My little lady loves Dora! My daughter LOVES Dora, so this is completely perfect for her! Thanks for the amazing giveaway! Dora and Diego are their favorite shows. I like watching Dora she so cute…A lot of kids like her…My niece love watching Dora shows also..
Spongebob. He also likes Dora. actually dora is my niece’s fav!